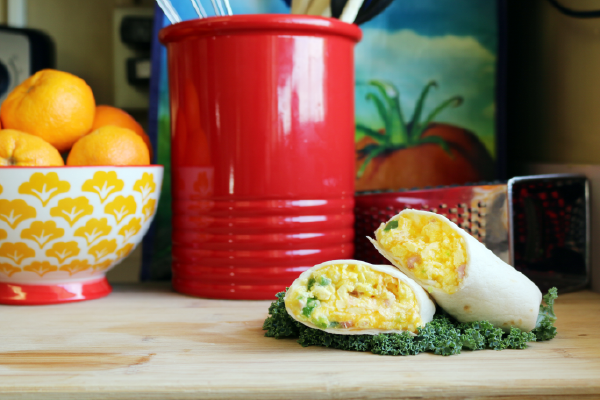 Add a little zest to your morning with breakfast burritos! In small bowl, make Zesty Sauce by mixing yogurt and salsa. Heat tortillas in 10″ skillet until warm (about 1 minute each). Wrap in foil. Spray 10″ skillet with non-stick spray. Put bell peppers, onions, and ham into skillet and stir-fry about 2 minutes over medium heat until vegetables start to soften. Add eggs and black pepper to skillet and stir often to scramble. Cook until eggs are set and not runny. Sprinkle cheese on top, cover, and turn off heat. Let stand 1 minute so cheese can melt. Spoon 1/4 of mixture down center of tortilla. Fold bottom up and side edges in. Repeat with remaining tortillas. Serve with Zesty Sauce on the side. In a small bowl, make Zesty Sauce by mixing yogurt and salsa. Spray a 2-quart, microwave-safe bowl with non-stick cooking spray. Add bell pepper, onion, ham, eggs, and black pepper. Cook in microwave 1 minute. Stir to scramble. Cook 1 minute more and stir to scramble. Continue heating until eggs are firm and not runny, stirring every minute to scramble. Remove from microwave and sprinkle cheese on top. Cover and set aside. Heat tortillas until warm (30-60 seconds). Spoon 1/4 egg mixture down center of the tortilla. Fold bottom of tortilla up and edges in. Repeat with remaining tortillas.